Watching Michael Franti joyously bounce around the stage with his shoulder length dreadlocks haphazardly flying in all directions, you would never suspect that he is the idealistic heir to John Lennon’s principles of peace. Deftly transforming Lennon’s “Power To The People” into his own slogan, “Power To The Peaceful,” Franti’s peacenik beliefs are inclusive of all humankind, his utopian vision of the future drawing no boundaries between races, religions or nationalities. 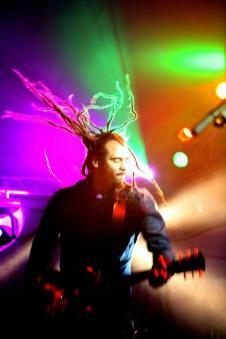 Much like the outspoken Beatle, Franti dares to imagine all the people living life in peace. It sounds as radical today as it did in Lennon’s day. Focusing on individual relationships instead of isms and ologies, Franti’s views and music are greatly informed by his recent travels in Iraq, Israel and Palestine and the time spent amongst those directly affected by war and conflict. Though liberally slanted and definitively anti-war, Franti’s politics aren’t divisive: we should revel in our differences rather than close our minds to different beliefs and stop using the fear of the unknown as an excuse to build barriers. A big believer in the power of community and the life-affirming power of love and friendship, his songs preach reliance on one’s own inner strength and beauty. More than uplifting words, Franti’s songs move with the same vitality. 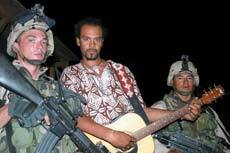 If you can’t have fun at a Michael Franti show, enjoying life might just not be your thing. Franti and Spearhead, the band he has long fronted, returned to New York City for a sold-out Saturday night show at a sweltering Nokia Theater. A veritable ringleader, Franti exhorted the crowd to jump along with him, generating enthusiastic responses with his steady query of “How you feeling?” With the heat inside the Nokia just starting to build, Franti had everyone signing along to “Hello Bonjour,” dancing wildly to “Sometimes” and grooving along with “Hey Now Now.” He touched on material from his latest album Yell Fire!, stripping “East To The West,” down to its acoustic core, only letting loose in the middle, and closing the set proper with a wild, incendiary version of the title track. Moving from the present, Franti looked backwards as well as ahead; he went deep into his catalog for “People In The Middle” and played a couple newer tunes as well. For his next album, Franti has expressed a desire to explore reggae; he and Spearhead returned to reggae’s steady, loping beats many times during their set, flushing out the echoey reverb of dub and dancehall. A nice showcase for drummer Manas Itiene’s voice - distinctly different from Franti’s comforting bass – an early detour into reggae covers was beneath the band and pandered to the white kids in the audience whose entire knowledge of the genre comes from repeated listening of Bob Marley’s Legend. A longtime staple of Franti’s shows, the only other full cover of the evening was a run through Sublime’s “What I Got” which segued into a medley of Sesame Street classics. When the moment suited them, they included riffs and snippets from other songs when it seemed appropriate, Dave Shul slid Jack White’s “Seven Nation Army” riff into one song, Sting’s wordless chant from “Every Little Thing She Does In Magic” worked its way into the background of another and Carl Young worked the bass line from Grand Master Flash &amp; The Funky Five’s “White Lines” into “Everybody Ona Move.” Franti even took a self deprecating twist during a segue into George Benson’s “On Broadway” noting that if he’s not up to playing this here guitar, his band can more than up for the fact. For the majority of the evening, Franti kept the energy in the room at sky-high levels. When the pace slowed though, the atmosphere dulled considerably. However, the leisurely paced acoustic section, essentially Franti with an acoustic guitar, had the same passion with Franti’s warmth and charisma making up for any musical gymnastics. The poignant “Never To Late,” needing nothing more than Franti’s message of friendship and community, to enthrall and inspire. In the spirit of Franti’s inclusive ideals, Spearhead received helping hands from friends both old and new. For “Everyone Deserves Music,” Franti brought out 18-year-old Australian guitarist Kieran Murphy, who laid down a couple nice solos; Anthony, the flower guy, friskily arranged a gigantic bouquet during “Everybody Ona Move” and Franti’s son repeatedly skated across the stage during “Say Hey” before hitting the brakes to do a goofy little jig with his dad. Franti’s message hasn’t changed dramatically over the last few years. It’s not laziness or the lack of creative vision; it’s more a reflection of the world’s unchanging bellicose politics that turns unwavering and unequivocal expressions of peace into a seemingly dissenting or subversive opinion. As long as there are divisive factions in the world, Franti’s voice will righteously ring out, pleading for harmony and urging power to the peaceful.